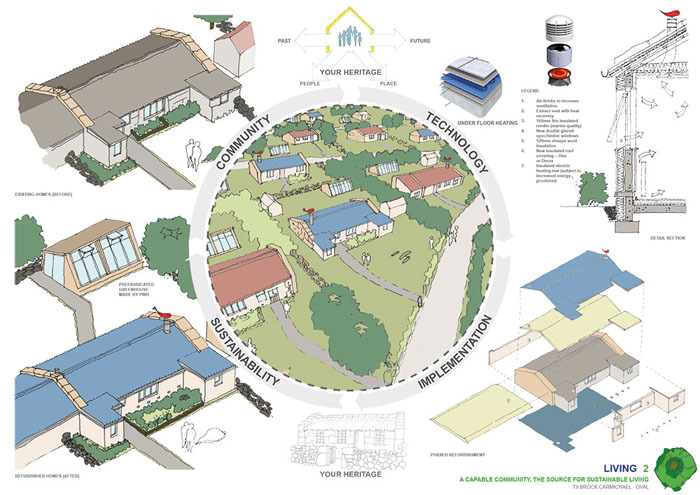 Information on the RIBA organised competition to design a more sustainable future for the Tristan da Cunha community. 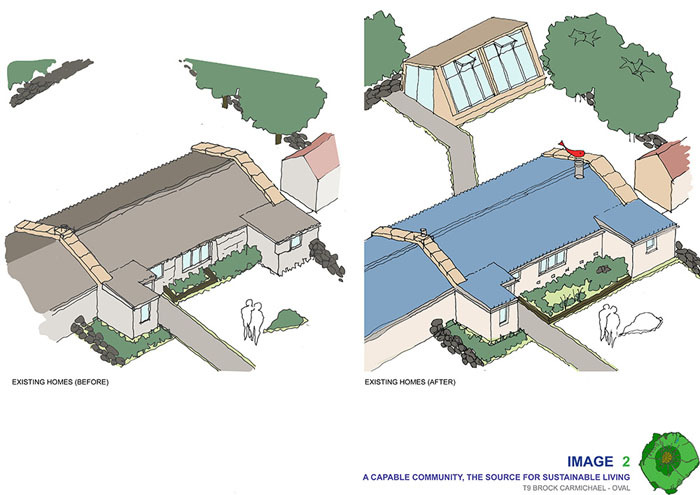 Administrator Alex Mitham reports that, during their meeting on 13th September 2016, the Tristan da Cunha Island Council have chosen Brock Carmichael as winners of the RIBA organised competition titled 'Designing a More Sustainable Future for the Tristan da Cunha's Community'. 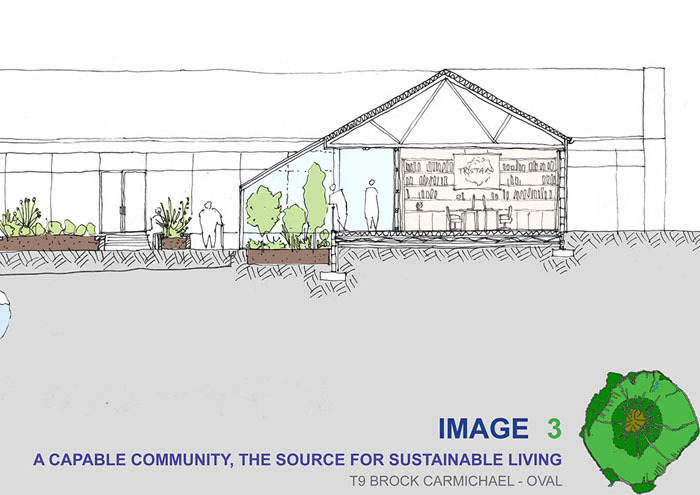 The Council felt that Brock Carmichael had the best design, and an in-depth understanding of the issues. The island will now move ahead to organise a visit by the Brock Carmichael team. It is significant that Alex was able to announce this decision as he prepares to leave Tristan, rounding off the design competition which was launched in March 2015. His successor, Sean Burns, will now lead liaison with Brock Carmichael, no doubt meeting their representatives in the UK during October, prior to travelling to Tristan to take up his second term as Administrator in November 2016.
as further refined during the design development phase of the competition. Editor's Note: These exciting and grandiose plans will have huge funding and planning implications. So it will be interesting to see how the designs progress to realisation in the future. as it approaches the 200th anniversary of being part of the United Kingdom in 2016.
taken from the helicopter of HMS Richmond on 31st October 2013 as their banner photograph. 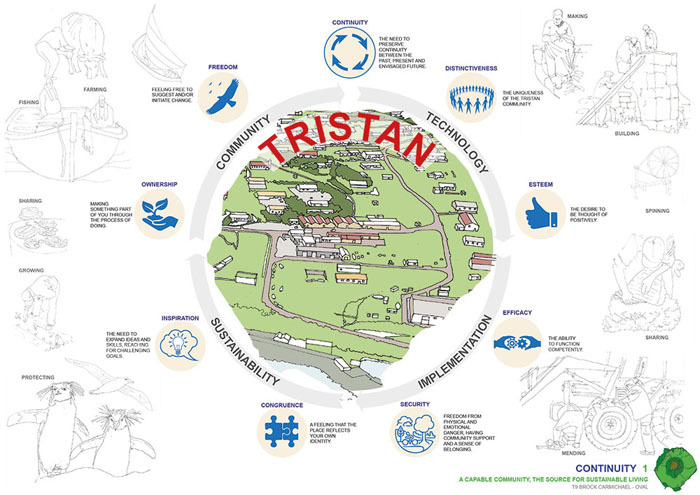 To coincide with the island's 200th Anniversary of being part of the United Kingdom in 2016, Tristanians are keen to see how the built environment and energy efficiency of all homes and government buildings can be improved. 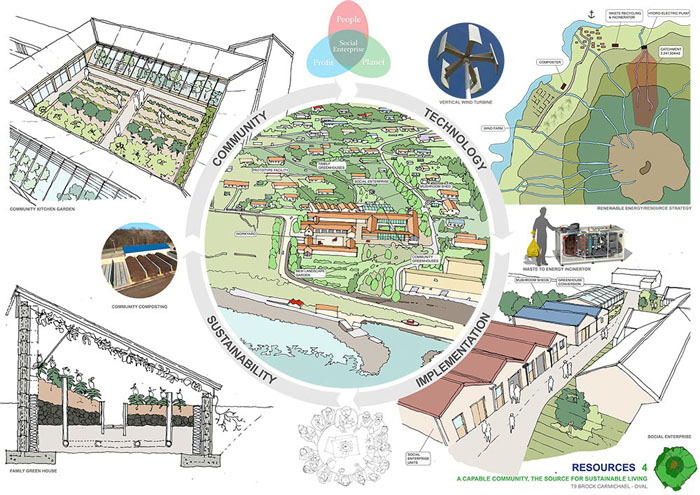 Design teams (to be led by a practising registered architect) from around the globe are invited to participate in this unique design competition that is seeking ideas to help the community become self-sustainable and ensure that Edinburgh of the Seven Seas is viable for future generations. The design competition is being managed on behalf of the Government of Tristan da Cunha by RIBA Competitions. Submission of design proposals which will be assessed anonymously. A long-list of up to 20 schemes will be selected by the Judging Panel, which will convene when the Administrator - who is resident on Tristan and the Head of Government - is next back in the UK around mid-June 2015. 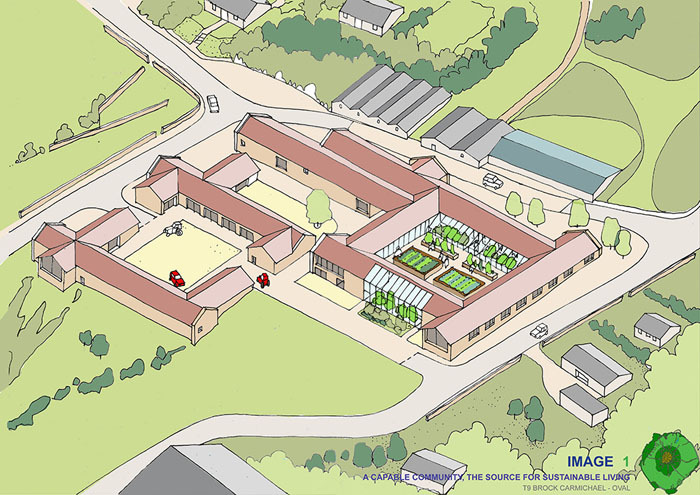 The long-listed design proposals will be subject to review by the Island Council (together with input from government departments) when the Administrator returns to Tristan, with a shortlist of up to five schemes identified in September 2015. Anonymity will be lifted and the authors of the five schemes invited to develop their ideas in response to feedback from the Phase1 assessment. 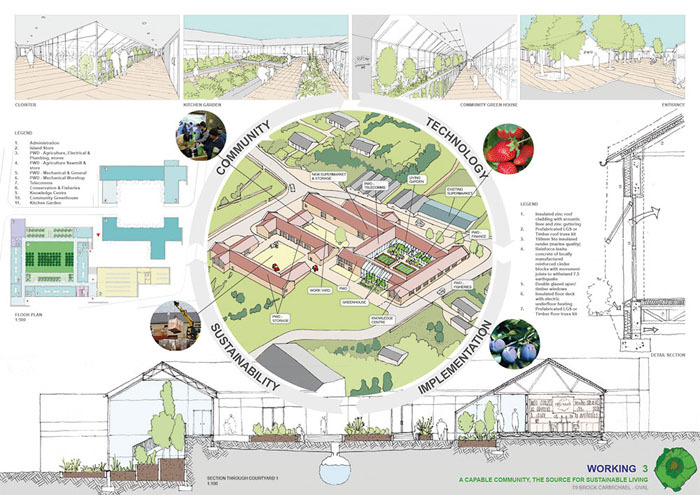 The Shortlist will need to assemble a cross-disciplinary team with appropriate skill sets to tackle the many different facets of the project and provide an indication of the potential costs associated with executing the propositions. The selection process will conclude with design teams being invited to present their proposals to the Judging Panel. The presentations will be held in London when the Administrator returns to the UK which is expected to be in early summer 2016. The competition is open to design teams from around the globe who must be led by a fully qualified architect. Architects practising in the UK should be registered with the Architects Registration Board (ARB), with overseas-based applicants registered to practice with an equivalent regulatory authority. At Phase 2, the authors of the five short-listed proposals will need to demonstrate their ability to assemble a cross-disciplinary team with appropriate skill-sets that would be capable of tackling the many different facets of the project. Applicants should note that the competition is initially a call for design ideas only. Progression of the winning proposals will be subject to the Government of Tristan da Cunha securing future funding for the project. We will update this page as news of the exciting competition progresses. It could end up being a case of "I'm an architect, get me out of here". Architects looking for a change of pace in their working lives are being sought in a unique design competition in which the winner will work for the most remote settled island in the world – more than 1,000 miles from the nearest continental land mass. There is bound to be more international interest and if this raises the profile of Tristan da Cunha in an increasingly hectic media world, so much the better. But the Independent is right, the scheduled ships are almost always fully booked and visits may be impossible, certainly in the time frame of the competition's first phase.